Most classrooms and schools are pretty noisy places in my experience. The hustle and bustle of everyone coming and going, doors and lockers opening and closing, bells ringing, and the hum of artificial light glowing in the classrooms is not what I'd consider a truly peaceful place. The classroom and natural laboratory that Miami-Dade Country students get to visit at the Marjory Stoneman Douglas Biscayne Nature Center on Key Biscayne while participating in the EarthEcho Water Challenge, however, is a far more beautiful place indeed. The shallow waters of the Atlantic Ocean off of Key Biscayne here in Miami are, in fact, extraordinary. The last time I visited the Biscayne Nature Center was when I joined famed world explorer Phillippe Cousteau, co-founder of Earth Echo International, and Sean Russell, the EarthEcho Water Challenge Manager, as we worked with over sixty local students to help them collect data so that they could participate in the EarthEcho Water Challenge. The shallow waters that day were still, like a sheet of glass, and the blue, cloudless sky was endless. The beach sands were warm and bright white, making it the perfect setting for the children to gently collect sea life with their seining nets and water samples to test while learning about the importance of our world's waters. As part of the day's fun, the students participated in the EarthEcho Water Challenge by collecting water samples, testing their samples and then both interpreting and reporting their findings. Along with the wonderful Biscayne Nature Center staff, volunteers from EarthEcho Water Challenge sponsor, Xylem, and the students' teachers, we taught the children how to use the EarthEcho Water Challenge kits to test the water's pH, dissolved oxygen content, turbidity, and temperature, and then how to interpret and log their results through the EarthEcho Water Challenge online database. This work allowed the students to join over 1.5 million people from 143 countries all over the world who have participated in the EarthEcho Water Challenge. 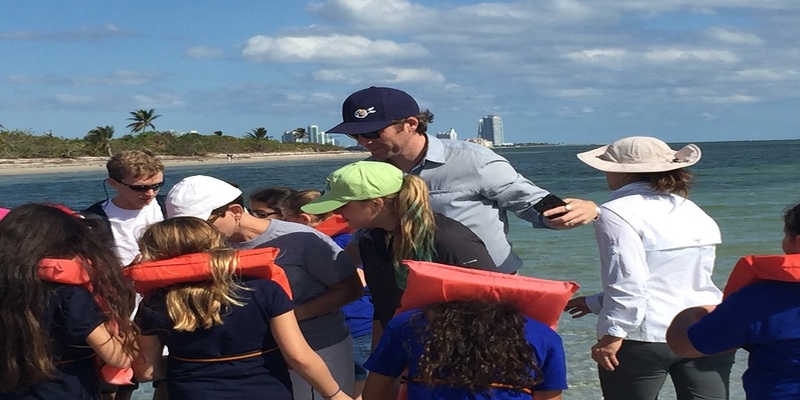 And as lovely as our day with the students on the shores of Biscayne Bay was, perhaps the best part is that you too can participate in the EarthEcho Water Challenge! This year, EarthEcho International and its Youth Leadership Council have created a new program: the EarthEcho Water Challenge Ambassadors. Young people ages 13-22 from the United States can apply to become an Ambassador and in doing so, receive an EarthEcho Water Challenge kit that will guide them through the process of monitoring water quality, including testing the pH, dissolved oxygen content, turbidity and temperature of their local waterways and sharing their data through the EarthEcho Water Challenge database. Ambassadors will also be responsible for putting together an event on or around September 18th, World Water Monitoring Day to engage their community members in water quality monitoring and conservation efforts. Ambassadors will have the opportunity to expand their knowledge of water quality and lead members of their community through the water quality monitoring process. They will also gain a diverse set of skills working alongside their peers and the EarthEcho International team, including EarthEcho co-founder, Philippe Cousteau, as they expand the EarthEcho Water Challenge in their local communities. 2. Share: Entering collected water quality data online in our international database and sharing stories and photos on social media using #MonitorWater. If you would like to apply to be a Water Challenge Ambassador and have the opportunity to work alongside the Youth Leadership Council members, as well as the EarthEcho team, visit www.monitorwater.org/ambassadors. Applications are due by February 19, 2018. Whether your own personal classroom becomes the ocean or a lake, pond, stream or canal near you, have fun completing the EarthEcho Water Challenge. And once you do, I do hope that you will engage others in your community by sharing what you learned and how they can take action to protect our planet’s water resources. Together we can test water quality, share our data, and protect our environment, so be sure to apply today to become an EarthEcho Water Challenge Ambassador! Editor's Note: Delaney Reynolds is a member of the EarthEcho Youth Leadership Council and a freshman at the University of Miami. She is the founder of the Sink or Swim Project and currently working with her fellow Youth Leadership Council members to launch the EarthEcho Water Challenge Ambassadors initiative.